I've been on a "food review" roll recently, but what to do, they're really awesome! 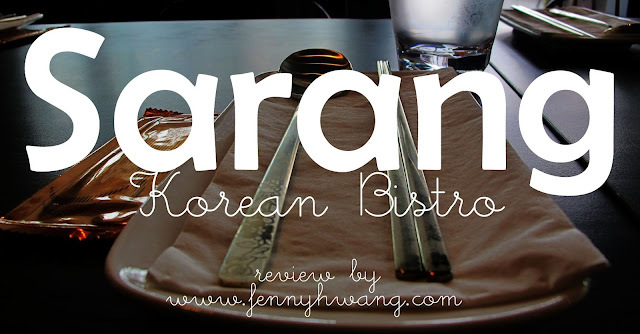 I was invited to try Sarang's new additions to their savoury Korean menu last week, and lets say I was too happy...I meant my tummy. They just reopened on 17 April 2013, also improvising their menu and recipes. Their new tapas menu actually consisted of more fusion food, like Japanese style or European style Korean food. I've been a fan of Korean BBQ, but sadly those places get you smelling like smoke when you leave :( Sarang has a Gangnam Style (no pun ok hehehe) Bistro setting and even had their furniture and deco imported from Korea! Okok less talk, more pics! *note: the food pictured in this post may not be the actual serving size, as I was there in a small group. The serving is actually bigger hahaha. We started off with a refreshing drink: Cucumber Soda ($6.80). It tastes like a fizzy cucumber >.< which is really cool because its not overly sweet (I hate sweet coolers) and it feels really nice. Check out the cafe-ish setting at the back! I like! And then, its the Korean dish that I have at all Korean restaurants I go - Japchae! Sarang Japchae ($7) consists of the usual japchae stuff, like glass noodles tossed with colourful vegetables in a sweet sauce. This was non-spicy, and it was really yummy without too much oil. I can't take really spicy stuff, so I always eat japchae at most places #fennyfact hahaha. This is Spicy Chewy Rice Cake ($7) and is also known as Deokboggi, tuk-bo-gi. Its actually chewy rice cakes in a spicy pepper paste with vegetables, a very popular street food in Korea. Not that I didn't like it. I don't like really spicy and peppery food in general. The rice cakes are chewy but not tough. Next up, Kimchi Pancake ($8). This was delicious! Okay you'll probably see the word "delicious" a few more times in this post. Its a kimchi-flavoured pancake with whole prawns, squid, onions and kimchi, with a dipping sauce of a lemony sesame-infused soy sauce. The pancake has a soft center with crispy sides, which proved it to be freshly cooked and not soggy. Now's the new modern tapas they're introducing! We have Okonomiyaki Style Scallion Pancake ($8.50). Frankly, I think this is the dish that's most worth it because eating an actual okonomiyaki with the ingredients here would cost more. This tastes like a thicker, more savoury (due to the many flavourful ingredients) and more chewy version of okonomiyaki, with the usual garnishes like bonito flakes, brown sauce and mayo. It contains scallions, other seafood, spring onions (I LOVE) and BACON. Awesomesauce. For this series of modern tapas, the perfect drinks to be paired with this meal are makgeolli mojito and lemon soju. Loved both of these drinks!!! Sarang Nachos ($9.50) is not your ordinary nachos. Its the best nachos I ever had!!!!!! It contains nachos with a nice corn & pepper taste, minced beef and fresh crunchy tomatoes (at the bottom) and drizzled with teriyaki sauce, mayo and sprinkled with spring onions. I took a chip (already had mayo & teriyaki sauce) and placed some beef and tomato bits on it. SO GOOD. This was reallyyyy delicious!!!!! Who knows nachos without cheese could taste good too? Do you find this dish of Crispy Tofu with Kimchi Cream Sauce ($5.50) familiar? Looks like a Japanese agedashi tofu doesn't it? It tasted really special because the sauce is actually made with gochujang (red pepper paste), kimchi and cream. The crispy outside of the tofu catches the right amount of sauce and again, it was a great match of textures as the inside of the tofu is really smooth, while the outside was crispy and also the garnishes were crispy. I loved the sauce! It wasn't too spicy for me. What a creative dish! The last modern tapas would be Ginseng Chicken Terrine ($16). Terrine is actually a pretty Western dish, something similar to a meatloaf or pate but it actually contains more finely-chopped ingredients with a smoother mouth-feel. This had chicken, ginseng, dates and other herbs compressed with chicken broth, a drizzled with pinenut sauce. It actually doesn't taste awfully ginsengy. It infact was pretty light, and the pinenut sauce complemented it nicely. Pinenut is actually a nutritious food to be eaten with ginseng, that's why the chef specially created this combination! From their popular signature mains is this BBBB or Big Bang Bulgogi Burger ($16). It is a dish of burgers with bulgogi beef, sandwiched between fresh vegetables and soft bread. The beef was well marinated and not tough at all! I love the combination of the beef with tangy tomato and the slightly sweet bread. On the side was some potato wedges with kimchi cream sauce. The chef recommends to have Kiwi Soju to go with this menu. Another of their signature main dishes is this Sarang Meat Lover's Platter ($42). It is more of a sharing dish for meat lovers to savour these awesomely marinated and flavourful Korean meat. There's wine-marinated pork belly (his mum's secret recipe!) which was sweet and delectable, chicken with yuzu dressing that was sweet and zesty, and beef steak with kimchi cream sauce. I don't know how they cook their beef cos its so cooked but not tough at all! It was served with a side of mashed potato and garlic for garnishing. The chicken and beef were my favourite on this platter! They say we have a seperate stomach for dessert! I thought I wasn't such a person but apparently, I AM. This dish is called Heotteok ($8) and is pronounced as heoh-tok. Its pastry with cinnamon sugar filling and almond chips atop. Eating this warm pastry with ice-cream was just awesome!! It was sweet, but it has a slight tinge of lian rong or tau sar (red bean) taste. The texture is actually alike with mochi, soft and chewy. Sarang's menu is conceptualized by its Head Chef, Mr. Y Y, who is a Korean himself. He experiments the possible combinations of Korean-fusion taste to meet Singapore's ever-changing tastebuds, and has been in Korea to take inspirations for the reopening of Sarang, be it interior, menu or deco. 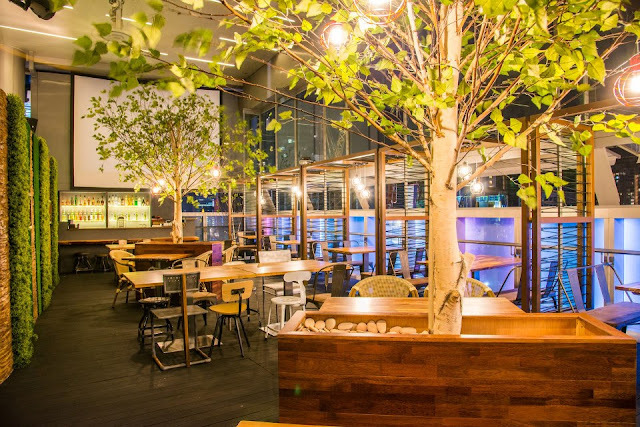 What you get in Sarang is a Gangnam Style cafe, overlooking a view of Orchard district while chilling in a vibrant environment. Definitely a perfect place for everyone! This is how it looks! 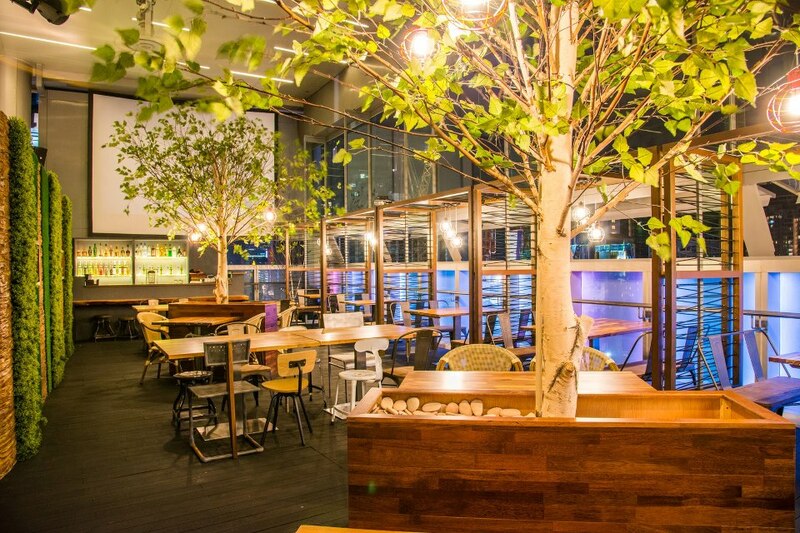 There's an alfresco area which has a more outdoor feel and also an indoor seating area. Spicy Beef Japchae, Wine-marinated Pork Belly, Oxtail Soup, Army Stew, Ginseng Chicken Soup, Sarang Steak, Braised Pork Ribs and Kimchi. You've gotta taste it to believe it heheh. I'll be back for more awesome Korean food for sure!